I am not currently working or taking bookings for at least 6 months due to ill health. development of cost-effective lighting guidelines: designed to protect the most vulnerable and significant items in your collection and safely allow you to increase display times or increase light levels for less light sensitive objects. The result can be a substantial cut in expensive light-driven object rotations, particularly for long-term exhibitions and loans and a better visitor experience. setting up a microfading capacity and staff training. This includes sourcing and modifying equipment, assistance with the software required and training in the analysis and interpretation of test data as well as the hardware. research: assistance with planning and carrying out research involving fading rate assessment. on-site fading rate assessments: timely and comprehensive reporting with specific, interpreted and contextualised display advice on the basis of the results. For an example of a report, click here. Conservators don't necessarily know what the actual fading rate of a potentially light-sensitive pigment or dye is, even an identified and well-characterised colourant let alone the vast range of unknown colouring materials in modern art collections, social or natural history museums and archives. This is not because conservators don't know their materials, but because the actual fading rates of individual colourants typically depend on their uniqiue physical and chemical contexts and how much they have already faded, as much as they are determined by their chemical identity. So even the identification of a dye or pigment (and associated mordants etc) doesn't necessarily provide its fading rate. In some cases - ball point pen inks are a good example - lightfastness varies so much that the only possible generalisation is that it is impossible to generalise; in other cases rates based on sparse published data, anecdotal evidence, and personal experience are more valid, but it is not possible to know without direct testing. The guesstimates we have relied on until now, no matter how conservative, will inevitably over-expose some objects and unnecessarily restrict the display of many more, and for institutions with permanent exhibitions the high rate of precautionary object replacements is likely to be extremely expensive as well as unnecessarily restrictive in terms of access and light levels. 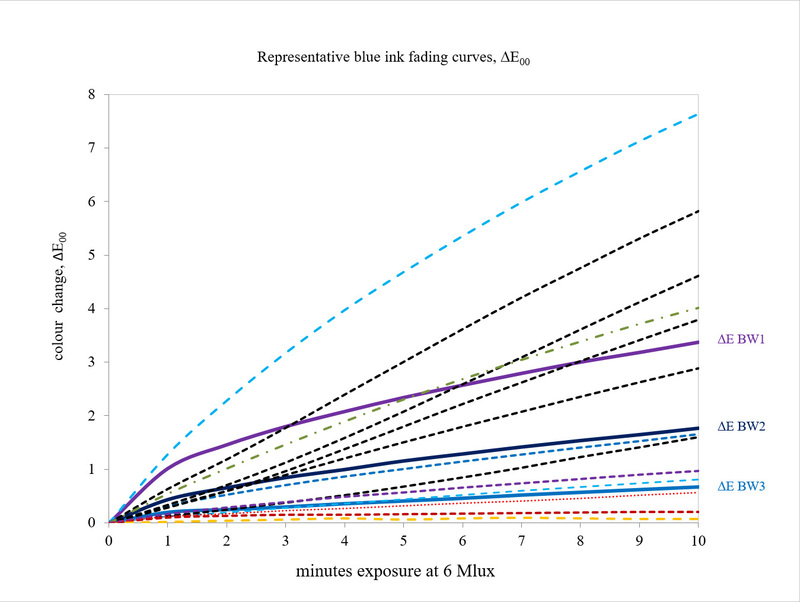 Using a combination of microfading as a screening method and a concise structured risk assessment process to contextualise the data it is possible to identify and protect the most light-sensitive and in-demand objects and relax restrictions on many more. Curators can spend their time curating rather than searching for alternatives to objects forced off display by unnecessary lighting restrictions; conservators devote less time to routine exhibition work; and most importantly visitors get to view the objects they came to see under decent lighting conditions. Guy Hansen, Senior Curator National Museum of Australia talks about some of the benefits to the Museum of microfading and a structured risk assessment.